A. L. Dyke Auto Supply Co. 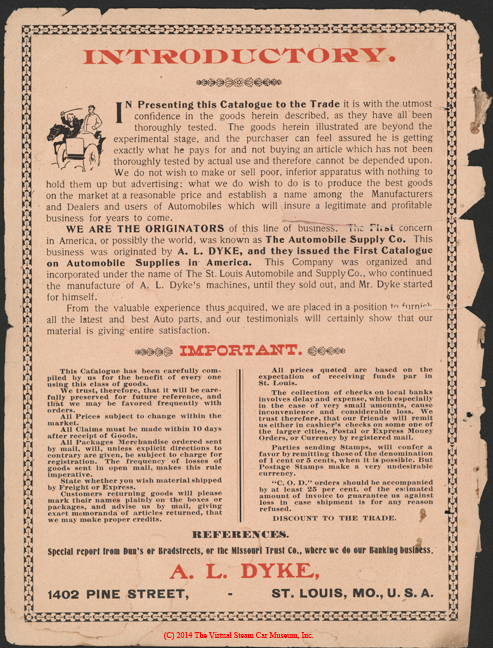 The Dyke steam car was the product of A. L. Dyke Auto Supply Company of St. Louis, MO. It apparently started in 1899 and survived for decades, morphing into Dyke's Automobile and Gasoline Engine Encyclopedia. Surviving Dyke catalogues claim it provided some of the first "build-it-yourself" cars. 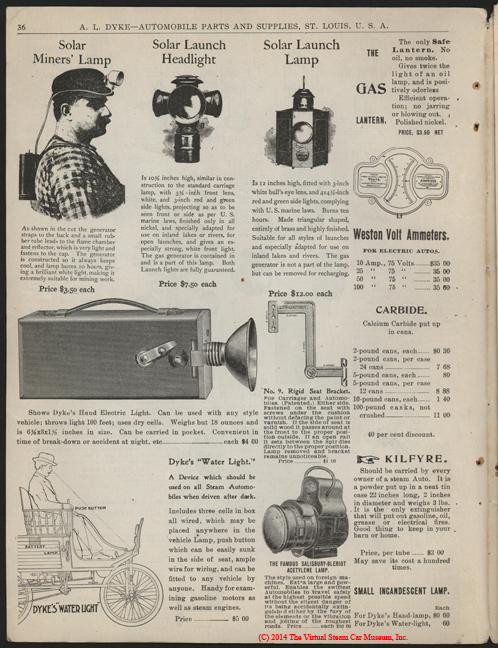 This advertisement appeared on February 7, 1902 on page 108 of the Scientific American. It encouraged its reader to send for the 1902 catalogue - see below. 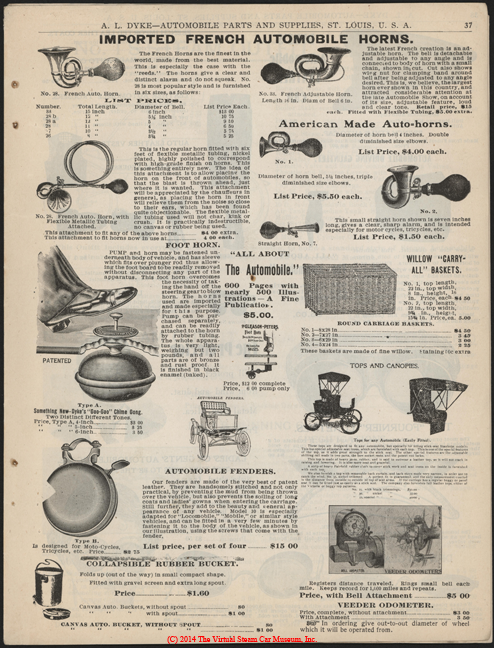 The Standard Catalog of American Cars show early Dyke automobiles built from 1899 to 1901, using gasoline engines, and sold in a kit form for assembly by the purchaser. They featured a 5 HP single-cylinder engine to a 12 HP two-cylinder engine. The various models sold from about $600 to $1,000. On three occasions, A. L. Dyke offer complete cars on the market. In 1899 he organized the St. Louis Electric Automobile Company and produced a stanhope and a runabout variously called a Dyke or St. Louis. In 1904 , a car with the name of Dyke-Britton, a 20 HP gasoline touring car was built by him and his new investor. Dyke's 1902 Cagalogue No. 7 offers a do-it-yourself steam car. One (perhaps two) of these Dyke Steamers survives. See the information below. A. L. Dyke's 1902 Catalogue No. 7. 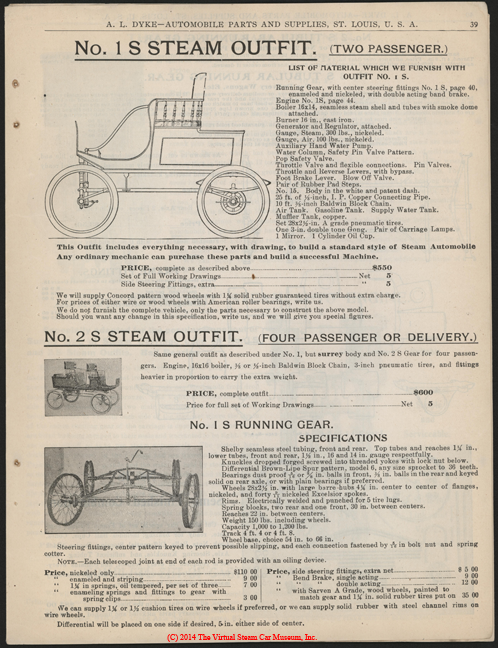 The catalogue featured a steam car section at the rear, but some items were particular to steam cars are found on other pages. In 1902, Dyke had already realized that hydro-carbon powered engines were automobile's future. The lady on the cover does seem to be driving a steam car. Dyke committment to the gasoline car, or hydro-carbon engine, is evident on page 3. The implication for electric and steam cars need not have been stated. Pages 36 and 37 carried steam car accessories, including Dyke's Water Light, a lamp to illuminate the water level gauge on Locomobiles. 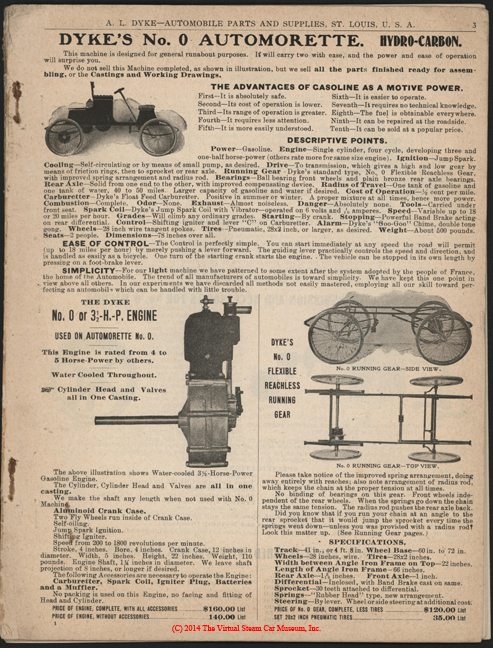 Dyke offered a wide range of steam cars and parts on pages 39 to 50 of his catalogue. Georgano, G. N., Encyclopedia of American Automobile, (New York, E. P. Dutton & Co., 1968), p. 114. Kimes, Beverly Rae and Clark, Henry Austin, Standard Catalogue of American Cars, 1805 - 1942<,/em>, (Iola, WI, 3rd Edition, 1996), p. 510. This exchange took place in 2003 on the Steamautomobile Forum. My grandfather had a 1900 Dyke Steamer that has been passed along to me. Family legend has it that there were only 10 of them out there when my grandfather put his together and I'm having a hard time finding any reference to the Dyke Company. Does anyone out there know anything about this vehicle? Dear Becky: If you have a Dyke Steamer, then you have the Dyke car kit that someone easily adapted a steam engine and boiler to. Could have been your Grandfather's adaption. Through many of the parts supply houses of the day, replacement steam engines and boilers were sold to who ever had the money to buy them. The Locomobile style car of 1900 was pretty common and most parts could be adapted from one car to another. 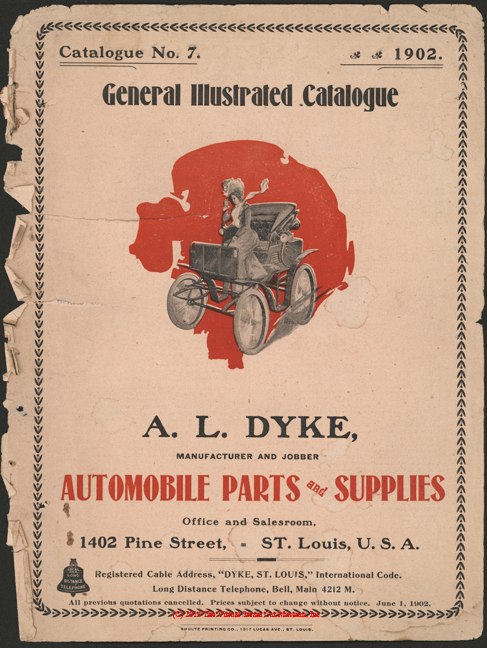 A. L. Dyke also listed steam car kits and components in his early catalogs, some pages of which have been reprinted in the Steam Automobile. I will look up which issue. I can Xerox them if you wish. Dear Dave, You did a better job of research than I did. My Standard Catalog of American cars let me down on the Dyke steam car. I looked over your referenced ads and wow, the Dyke steamer sure looks like the Locomobile design. Just about like every steam car manufacturer in 1900 looked like Locomobile's unique design. Today, if anyone copies another's car design, with in days they find themselves in court for copyright infringement. Studebaker just came out with the Humve (sp?) look alike at a recent auto show, and instantly, they had their hands full of lawyers. The Locomobile made such a splash that every body and his brother copied it! Only certain details of the Locomobile sub frame were patented, thus look alike chassis were common. My grandfather built a steam car from mail order components, never made it run to his satisfaction and eventually threw the remains into Battle Lake, Minn. I wonder if A. L. Dyke was one of his sources. Thank you so much for all the information! I know that Grandpa put the kit together himsef. He was quite an antique car collector and I can't imagine that he would have adapted the car from the original design. What concerns me is that the car is now sitting on jacks in my garage and I don't know if there's anything I should be doing for it to keep it at it's best. Is there a source I should be looking to for basic maintenance on it? Thanks again for your help. Kati asked me to relay the following: The Dyke Company appears to have been located in St Louis, Missouri. I have emailed their chamber of commerce for assistance. I dug through my boxes of photos and found pictures of my father-in-law's 1901 Cadillac and 1908 Buick but none of the Dyke. The Dyke is located in Florida and I will try to obtain a photo from my niece. The body is of plywood construction and was fabricated by my father-in-law who had no photos, manuals, or other text to guide him in putting together this car from pieces that had never previously been assembled. The following email message from Art Hart of Vintage Steam Products provides some additional information. The A. L. Dyke Supply Co. was located on Olive Street in St. Louis, Missouri. according to the May 1904 catalog I have which is called: Dykes Automobile Bulletin"a medium for all interested in new motorities" Thanks for the information. Where was the Dyke company located? I don't think you are going to find out a lot about the Dyke steamer you have as it was offered through Dyke's catalog with several options on type of chassis and types of body - even types of motive power. You could build nearly the same car with a gasoline engine (actually several different gasoline engines, if I remember correctly). My earliest original Dykes catalog is from 1904 and by then they were not offering kits, altho all the parts to build a car were available as separate items. I do have a 1903 Charles Miller Co. catalog and they were still showing kits similar to what Dyke offered. I think the only information you will be able to find would be copies of original Dykes catalogs that may be available from some of the automotive libraries like the Ford Musuem or the HCCA library. My family owns a 1901 Dyke steamer. The car is complete, but not currently running. It was running at some point. The history of this car is as follows. My father-in-law purchased this car from a farmer who was the original purchaser. The farmer took delivery of the car in crated and unassembled condition. No body was included in the kit. The farmer never got around to competing the assembly and stored the parts in his barn. My father-in-law owned a Cadillac dealership in Indiana. He had the mechanical acumen and resources to assemble the car and put it in running order. However, he died in 1986 and the family has lost much of the information regarding this car. Can you direct me to somebody who has information on the car and its manufacturer? I recall that Hemmings Motor News ran an advertisement of a 1902 Dyke steamer for sale at some point in the last few years. That tells me that at least one other model survives. I thank you for any assistance you are able to provide.